"Investigation" is a unifying theme in this issue, which features the experimental work of Matthew Szösz on the cover and a consideration of his work by contributing editor William Warmus. 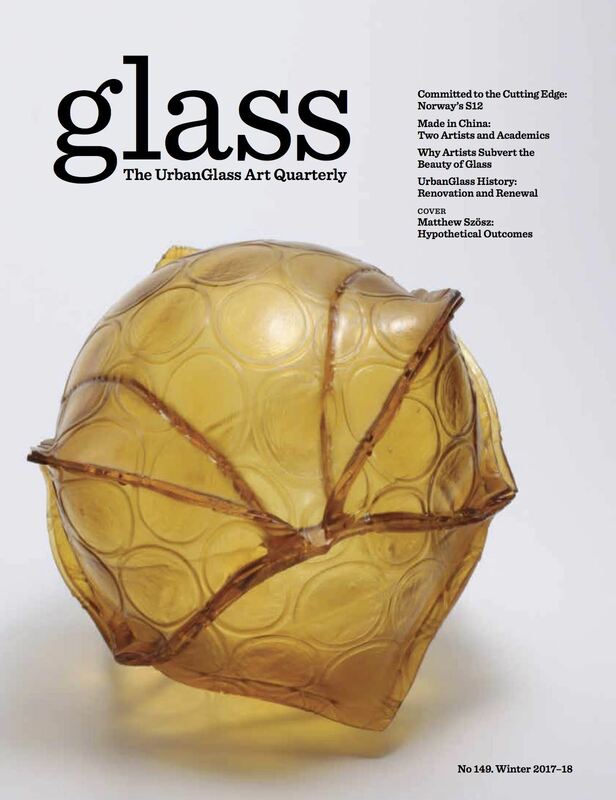 In his debut as a contributor to Glass, artist and educator Justin Ginsberg documents S12, a unique art center in Norway as it celebrates a decade of artist residencies and exhibitions highlighting multimedia artwork incorporating glass. 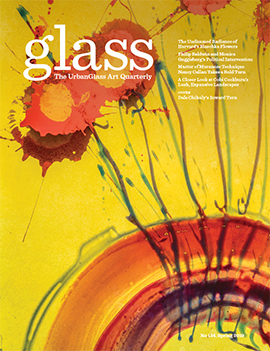 In an expansive and illuminating essay, independent curator and critic Vicky A. Clark examines trends in philosophy and aesthetics, looking closely at how the material of glass—with its smooth and shiny surfaces and translucent glow—can limit response to contemporary trends in art. Clark cites a range of artists working with glass in this way, but gives special focus to the examples of Doreen Garner and Ron Desmett. Artist Gerry King takes the measure of two artists in China, each of whom heads a prominent university program in a country just beginning to embrace the material as a sculptural medium. King considers the kiln-cast works of Guan Donghai and Han Xi, and examines how each represents the future as educators and artists while honoring their country's vast history. And finally, we present the last installment in our year-long series examining the story of UrbanGlass, which turned 40 this year. Picking up in the year 2000, we learn how a city-led renovation of its building pushed the art center to the brink, and how an expanded vision for UrbanGlass has emerged to usher in a new era. Clifford Rainey, who lost everything in the Northern California wildfires, to make drawings out of a charred landscape; Karen LaMonte is awarded the 2018 Specialty Glass Residency at Corning; Diane Wright to move to the Toledo Museum of Art from the Chrysler Museum; Anjali Srinivasan wins the 2017 Irvin Borowsky International Prize from University of the Arts; exhibit explores Albert Paley’s two-decade wrestling match between steel and glass. 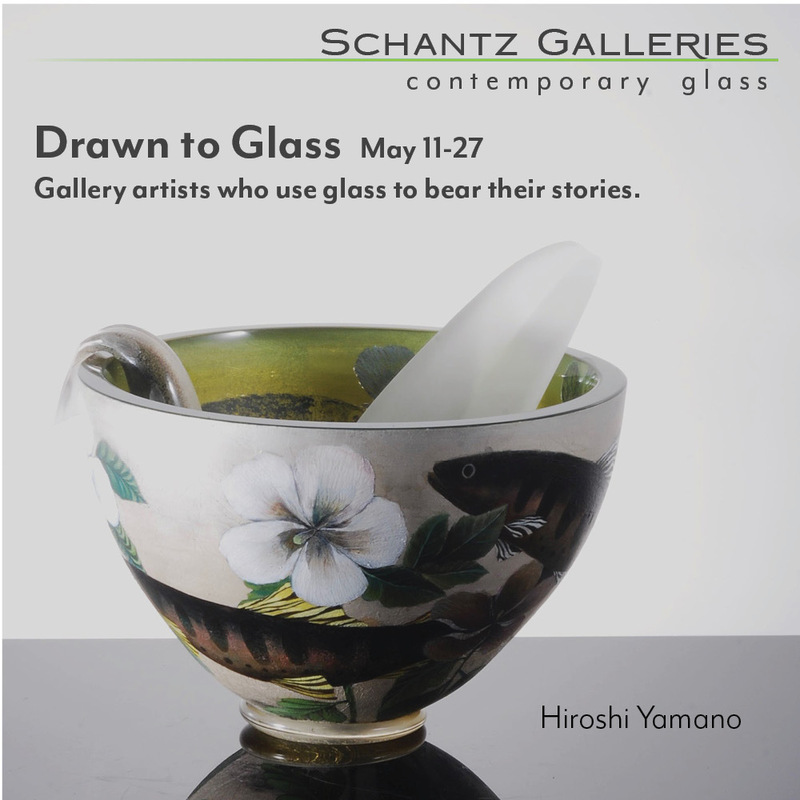 James Mongrain at the Museum of Glass, Tacoma; Ettore Sottsass at Le Stanze del Vetro, Venice; Birdie Lusch at Kerry Schuss Gallery, New York; group exhibition at Chazan Gallery at Wheeler, Providence; and John Kiley at Traver Gallery, Seattle. Program founder Annette Rose-Shapiro returns as the Bead Project turns 20. Collectors looking to ensure a legacy (and win favorable tax deductions) face a competitive landscape for museum donations. Through meticulous experiments using vintage technology, Matthew Szösz undermines industrial techniques (and invents new ones) to channel Foucault and meditate on the increasingly tense dynamic between art and technology. Chinese artists Guan Donghai and Han Xi both lead prominent university programs, and each seeks to bridge past and future as he advances the rapidly expanding field of glass art in China. Contemporary art with challenging content requires a wide range of aesthetic approaches that defy material stereotypes. A city initiative to remake the Brooklyn-based nonprofit’s building threatens its very survival, but UrbanGlass reopens on a stronger footing, with new leadership and an expanded vision. Only a decade old, Norway’s S12 Studio and Gallery has become a global leader in fostering notable interdisciplinary work from a new generation of artists using glass.